Areas of Outstanding Natural Beauty (AONBs) are designated by the Government for the purpose of ensuring that the special qualities of the finest landscapes in England, Wales and Northern Ireland are conserved and enhanced. The primary purpose of AONB designation is to conserve and enhance the natural beauty of the area. Local authorities (with responsibilities for AONBs) have a statutory duty to produce these Plans in order to demonstrate how these protected landscapes can be conserved and enhanced. The AONB Partnership then undertakes this process on their behalf. The Tamar Valley AONB is a hugely important piece of the countryside. There is a Management Plan that sets out how we and our partners will look after the area. With the activities of the local communities, farmers, landowners, businesses and visitors we can help influence, protect and conserve the future of the Tamar Valley AONB. 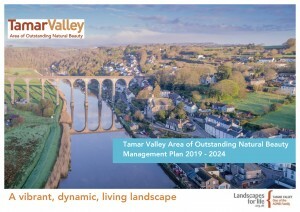 This Plan forms a revised strategy for the Tamar Valley AONB from 2019–2024. It has been developed through an extensive consultation and review process with a wide range of agencies, organisations and individuals who live and work in the area.